HAMDEN, Conn. - When choosing plants for your landscape, it's not all about looks. Versatile native plants can provide valuable food for butterflies and birds. Native plants are also low maintenance and, once established, use less water, according to Andy Brand, nursery manager of Broken Arrow Nursery, located in Hamden, Conn.
"Cookie cutter landscapes attract very few birds and insects," Brand said, showing a slide of a large front yard with a tree dotted in the middle. "You won't find a lot of butterfly species feeding on lawns. It's tough to complete a life cycle for a caterpillar if a lawn mower is going over them once a week." When gardening for insects and birds, more native plants increase the likelihood that they will visit. Even weeds can be host plants for butterflies to lay eggs. "It sounds nuts, but let some stinging nettles grow up," he said. of a spicebush and a close up of the spicebush caterpillar. The black cherry tree benefits both butterflies and birds. "Most people don't pick it because of fruit, but because of the beautiful white flowers in the spring," said Brand. Eastern Tiger Swallowtails and Coral Hairstreaks both lay eggs on it. Birds eat the fruit. "If I was going to pick a plant that I would almost guarantee you'd have success with rearing caterpillars, it would be lindera, or spicebush, in your yard," Brand said. 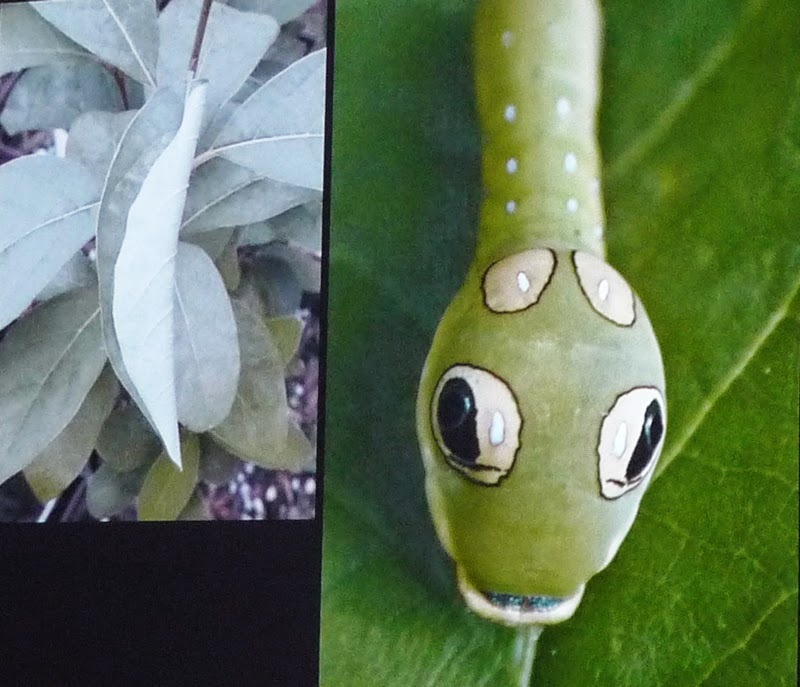 "You will find spicebush swallowtail butterflies." All parts of the plant have a spicy aroma. It will tolerate at least a half day of shade as well. "I get excited when I see spicebushes [lindera] being chewed up by spicebush caterpillars," he said. "The leaves will fold over and inside is a very 'menacing' caterpillar," Brand said. This is how the caterpillar protects itself from birds. If a bird does happen to turn the leaf over and find it, it will be in for a surprise. "If a bird sees false eyes staring at it, the bird will get scared," he said. The bird will not eat the caterpillar due to its appearance. "It's one of my favorite caterpillars - it's very distinct." Spicebush does form red fruit that will be eaten by birds later in the season. The fruit on bayberry is nutritious for birds. Bayberry plants are male and female, so you need one of each to get fruit. "It will sucker and form a pretty good colony over time. Yellow warblers like them," Brand said. Winterberry also needs a male and female plant in order to produce fruit. "You need to have the appropriate male winterberry holly for the female," he said "It's important to go to a nursery and look for appropriate male and female set." "Winterberry is my favorite plant to put in for attracting birds," he said. Robins, catbirds, hermit thrushes and more will feast on the berries from December through January. They can reach 8 to 10 feet tall, but a shorter variety, called Red Sprite, will only grow 5 feet tall. Native viburnum is a shrub that benefits butterflies and birds. The little wood satyr is one butterfly that visits the white flowers in the spring. Viburnum Arrowwood provides larval food for butterflies and moths and has blue fruit in the fall that feeds the birds. "The more you have, the more fruit [you will have], then lots and lots of birds fighting for them," such as catbirds, he said. American holly will tolerate a little bit of shade, but is not an easy plant to work with due to its sharp, prickly leaves. "We get flocks of robins that will start in one corner and will go from tree to tree until all the fruit is gone," said Brand. This bush is popular with robins, cedar waxwings and bluebirds. 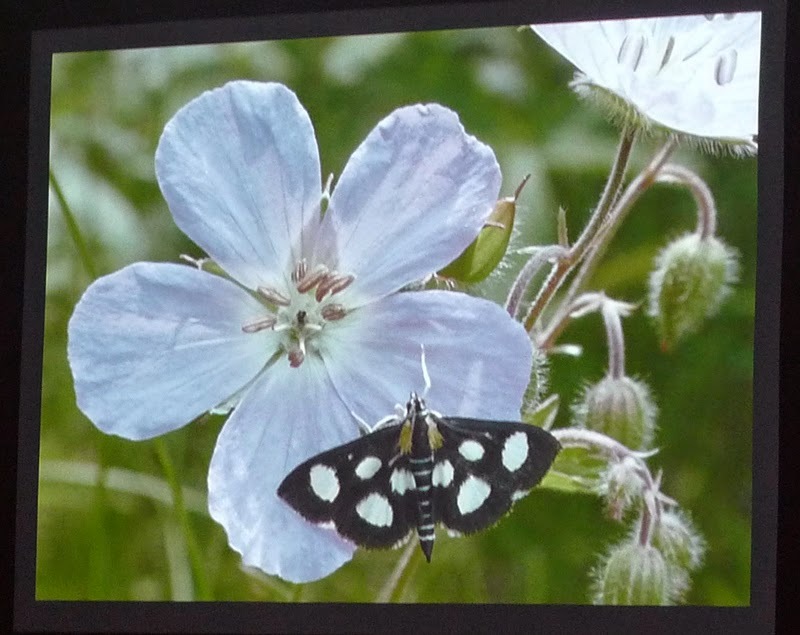 Wild geranium is one of the best nectar sources for early butterflies, specifically early skippers, according to Brand. It will reseed in the garden. blossom and an eight spotted forester moth. "If I had to plant a particular plant that would be nectar and host plant for monarchs, I'd pick milkweed," said Brand, "There's a milkweed for every habitat we have." Monarchs only feed on milkweed. Common milkweed is rich in nectar. If you have moist areas, swamp milkweed is a perfect choice. Brand's favorite is the asclepias tuberosa, or butterfly weed, because it grows in a wide range of soils. Goldenrods are also an important nectar source for butterflies, including monarchs, because they provide food late in the season. "If you get into a patch of goldenrod, you can spend hours watching the species it attracts," said Brand. Brand said gardening for biodiversity requires a different approach. "It's a different mindset - the more diverse the plant materials, the more diverse the insects."